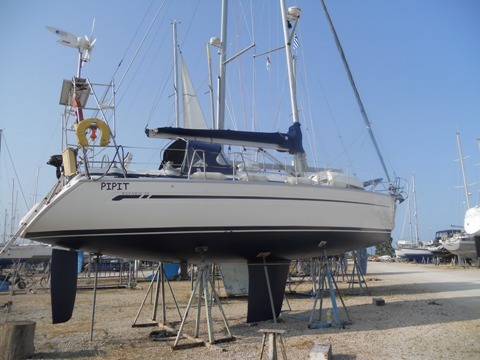 After spending a few days in Vathy balancing some relaxation and socialising with domestic chores, we headed up to Preveza via the Lefkas Canal to have Pipit lifted out of the water at Cleopatra Marina. We had the prevailing headwind en-route which delayed our arrival at the bridge for the hourly opening, but there was plenty of space to anchor off the town quay to wait for the next opening. 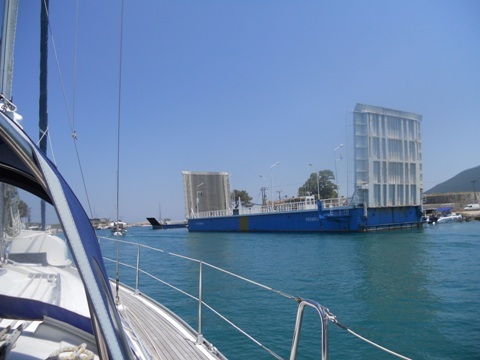 As we understand it the floating bridge which swings is classified as a ferry, which means Lefkas retains its status as an island and thus attracts additional funding from Athens. If a permanent swing bridge was constructed this would no longer be the case. It was with some trepidation that we negotiated the last and particularly narrow part of the Canal on the north side of the bridge, as the depths are shallow with a sand spit on one side and lumps of rock and/or concrete blocks on the other, but we made it through without incident and not a little relief! Through the Lefkas Canal Floating Bridge. We opted to stay in the marina overnight as our lift out time was 0900 the next morning, taking the opportunity to ensure we were ready for the lift and playing the annual game of cockpit locker jigsaw. This involves Andy climbing in and removing everything else from the deep cockpit locker to get out from the very back of it the two plastic boxes in which we store all the annual maintenance gubbins. Not his favourite game in the searing afternoon heat! Lots of growth - no wonder our speed was reduced! 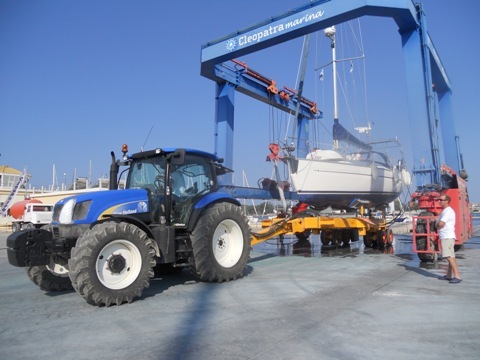 The yard staff were excellent, taking great care during the operation of lifting Pipit in the travel hoist, pressure washing which removed virtually all the growth, transferring her to a hydraulic trailer, then propping her in the yard. Much of their equipment looks quite new and they seemed meticulous in keeping it all clean. The first three days of our time in the yard were coincidentally the hottest of the year so far so we were very pleased we had booked ourselves into one of the air-conditioned en-suite rooms at the marina. After each day's work in the heat, we could return to a blissfully cool private room, have a shower and relax over a cold beer from the fridge (although billed as a 'mini-bar', conveniently large enough to store the contents of the boat fridge). The room also had a small balcony from which we had a view of Pipit and the inland sea of the Gulf of Amvrakia beyond the boatyard - all in all a very civilised situation. The view from the balcony of our room - nice boat down there! Our air-conditioned haven is on the top left where the line points. Rather than trying to cook dinner aboard Pipit (the main saloon was a mildly organised chaos of tools, paint, etc) and draining a sink full of washing up water into a bucket to avoid it running down the hull, we again opted for the civilised choice of the on-site taverna. Panos and his crew gave us a really warm welcome each evening and served good food - the Greek specialities and grilled meats beautifully cooked and were our particular favourites. My birthday was celebrated with breakfast at the taverna, followed by a day of polishing the hull, or rather helping Andy move the platform from which he polished the topsides. Moving it was hampered slightly by the gravel in the yard and one wheel bracket being collapsed and ineffective. Hard, hot work, and although we'd have liked to get a better finish in parts, Pipit was looking bright and shiny at the end of the day, as was Andy - despite lathering with sunscreen! We had a typically delicious dinner at the taverna although Andy wants to treat me to a proper birthday meal in August - who could complain! 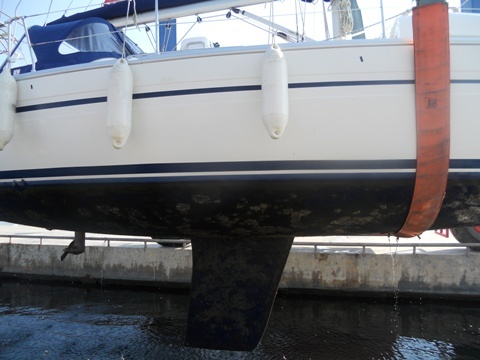 There were more patches this year on the underwater sections of the hull that required priming (we got through two tins of Primocon) and we may need to have all the old antifouling blasted off when we lift out next year. By Thursday we had polished the topsides, antifouled, changed the saildrive oil, replaced the saildrive anode and fridge keel cooler anodes, scrubbed the fridge keel cooler to remove as many barnacles as possible, sprayed Mille Drive (antifouling for metal) onto the saildrive and bottom rudder bearing housing and were ready for re-launch on Friday morning. 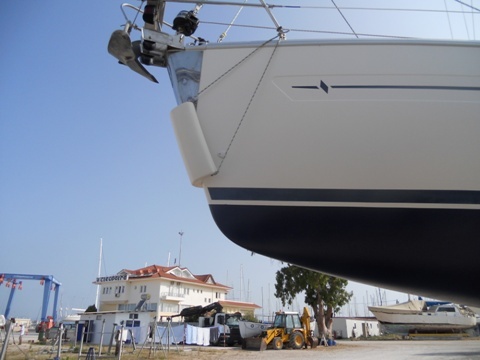 Looking ship shape & Preveza fashion with a clean bottom - all ready to go back into the water. We re-launched and spent another night at the marina to allow Andy to play the cockpit locker jigsaw game again to pack everything back where it belongs, wash the yard dust from the deck and coachroof and have a final beer at the taverna and say "goodbye" to Panos - except we weakened and ended up having another tasty meal there - ah well... Our loyalty had been repaid by the odd gratis carafe of wine and brandies during the week though. During the early hours of the next morning as we drifted into wakefulness, we heard what we assumed was a school of fish bumping under our hull. We hear this often, but this school was knocking so loudly I was tempted to invite them in! 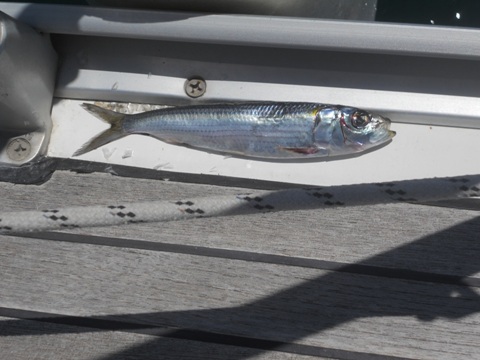 When I went on deck the next morning, I found a sardine next to the toe rail. 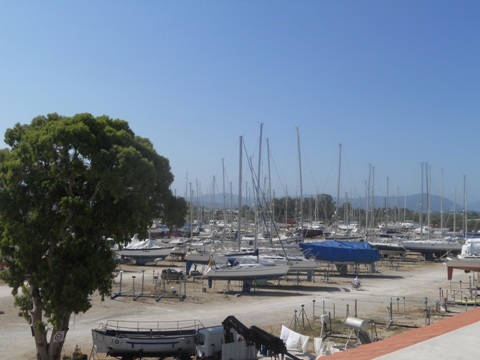 We were advised that we should report to the Port Police at Preveza after re-launch, so on Saturday morning we took Cleopatra's daily launch across to the town quay and made our way to the office. This is where things took an unexpected turn - they had DEKPAs! However, because it was Saturday, the tax office was closed which meant we couldn't pay and so couldn't have one! This all took us by surprise as DEKPAs haven't been available for a long time. We were told to come back on Monday when the tax office would be open. This didn't really suit our plans and although the staff were polite and friendly to us, after much heated discussion amongst themselves and a few phone calls, an entry was made for Pipit in a dusty old ledger and we were given another piece of paper, written in Greek, in lieu of a DEKPA. We shall see what this all means when we are next somewhere with a Port Police office. On our return to Cleopatra Marina we were keen to make our departure as soon as possible as once the wind comes up in the late morning this, combined with a surprising amount of current, makes manoeuvring tricky. 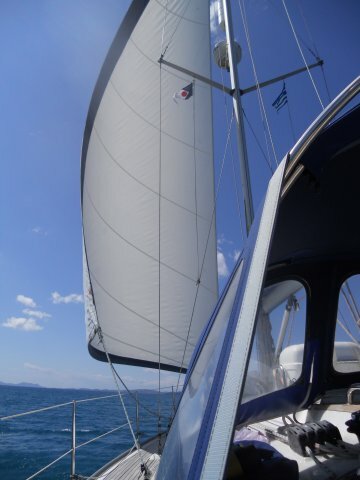 We made our exit and anchored on the north side of the bay some distance from Preveza town quay. This proved to be a peaceful spot where there were a few other boats anchored and a welcome contrast to the hard work of the previous week. We even had a visit from a pair of dolphins and saw a number of loggerhead turtles. 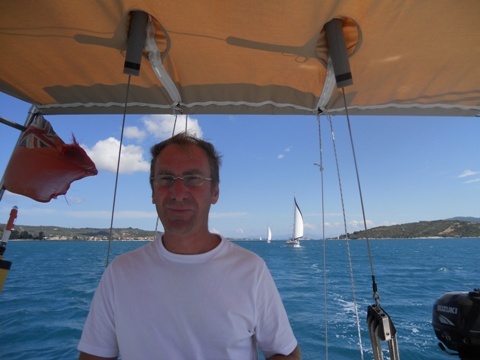 We weighed anchor early the next morning, keen to get into the shelter of the Lefkas canal before the wind and sea rose. 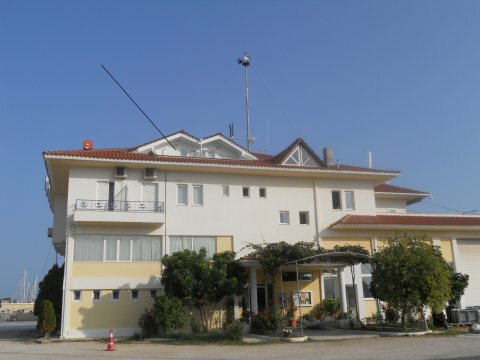 The sea was already lumpy in the channel leading out of Preveza and down towards the Canal - it must be at best very unpleasant here in poor conditions. As the wind was the usual northerly we had a fast if slightly rolly downwind sail to the Canal entrance and passed through the 'tricky bit' intentionally slightly nearer the north (sandy) side than we did going out. We milled around for about 15 minutes until the bridge swung open and then led a mini flotilla motoring down through the canal. As soon as we cleared the last lateral buoys at the south end of the canal, we set the genoa, as did every yacht that followed behind us. We had a fabulous sail down to Vathy in flat seas and glorious sunshine, and were warmly welcomed back to Odyseas Marina, our new home base. 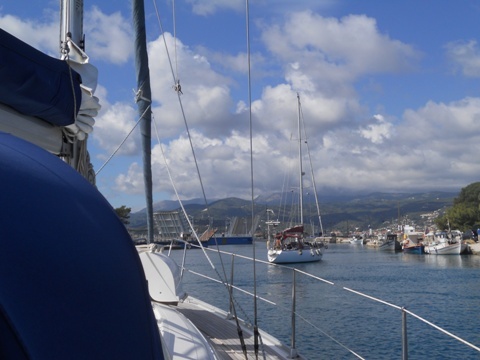 Open Sesame (don't think we've used that since Vannes) for the trip back down the Lefkas Canal. A clean bottom, an F5 and a flat sea - this is where our season really starts! The mountainous backdrops and sailing conditions have made us realise why we liked the Spanish Rias so much - very similar. Catch us if you can! Every yacht set sail in the perfect conditions as soon as they cleared the canal. Actually the other Bavaria did, but it was much bigger and had both sails set.